Planning a Wasaga Beach camping adventure? Our comprehensive guide to camping in Wasaga Beach offers suggestions on the top Wasaga Beach campgrounds. We’ve also complied a list of the most popular attractions and experiences so you’re Wasaga Beach camping vacation is full of fun! Wasaga Beach Camping: enjoy an al fresco feast on an RV campsite. This summer Wheel Estate challenged me to explore my own backyard by organizing an RV camping trip to a local park or campground. After doing a simple search to see what RVs were available for rent in Ontario I played around with the websites responsive map to see what parks and campgrounds were located nearby. I settled on a cozy travel trailer in Wasaga Beach, and over the next few days enjoyed chatting back and forth with the RVs owner to coordinate our three night long weekend. With over 2.1 million RVs privately owned in Canada, and an average rate of use at 14 days per year, Wheel Estate has seized the opportunity to bring the sharing economy to the industry. Not only creating safe, affordable and flexible means of travel, while supporting the local economy, Wheel Estate has also created an incredible opportunity for trailer owners to earn passive income. Living up to their motto of “List. Rent. Relax,” all verified trailers listed on the site are covered at no extra cost by a $1 million insurance policy, and are eligible for 24-hour roadside assistance. If you’re not a seasoned RV adventurer like me, Wheel Estate makes planning a comfortable camping holiday a breeze. Those who like to keep their hands off the wheel can simply pay an additional fee to have the rental set up on arrival day and picked up on your day of departure. 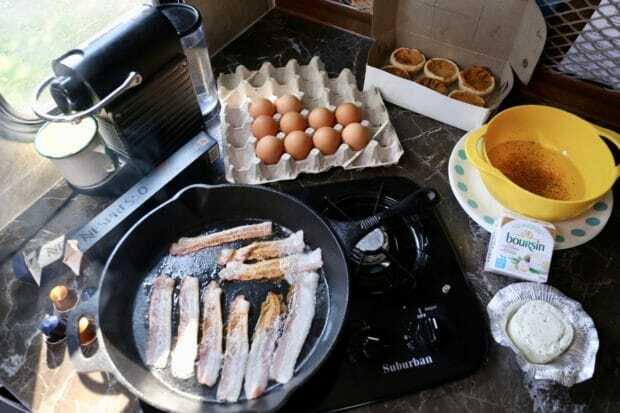 Wasaga Beach Camping: preparing breakfast in an RV. If it’s your first time camping at Ontario’s most famous beach, rest assured there are plenty of fun things to see and do over the course of a long weekend. Wasaga is located a short two hour drive north of Toronto, a stones throw from Barrie and Collingwood. Wasaga is a very popular destination for families and nature lovers in Ontario. There are plenty of Wasaga Beach campgrounds to choose from. The majority of campgrounds in Wasaga Beach run from May to October. Wasaga Pines: is a RV camping resort located a short 10 minute drive from the beach in Elmvale. The family friendly campground includes overnight RV camping, 200 full-service seasonal sites, and yurt rentals. You’ll also find two swimming pools, entertainment room, snack shop and outdoor activities. Wasaga Dunes: is another RV camping resort managed by Parkbridge. Wasaga Dunes campground in Wasaga Beach offers 200 sites for RVs and rustic camping. Gateway Camping: is a quiet family campground located walking distance from the beach. It features 61 campsites as well as a heated saltwater pool, RV hookups, and fire pits. Wasaga Holiday Park: a short walk to Beach 1 featuring 135 camping sites. Features a separate tenting area. Bell’s Maple Park: an RV seasonal park with 390 sites. Cedar Grove Park On The Bay: the only campground in Wasaga with private beach and waterfront camping. 150 seasonal and overnight camp sites. Jell-E-Bean Campground: located within a 5 minute walk from the beach. Total of 147 tent and trailer camping sites. Wasaga Sunshine Park: open concept, party campground with Olympic size volleyball and basketball courts. 205 sites located less than 500 meters from the beach. Craigleith: is managed by Ontario Parks. Craigleith Provincial Park is located closer to Collingwood, just west of Wasaga. The campgrounds within the park include space for tented camps as well as RVs. It’s the best option if you’re looking to camp in nature. Wasaga Beach is home to the world’s longest freshwater beach, and its sandy shores on Georgian Bay are the draw for city slickers looking to rest and relax during the warm summer months. 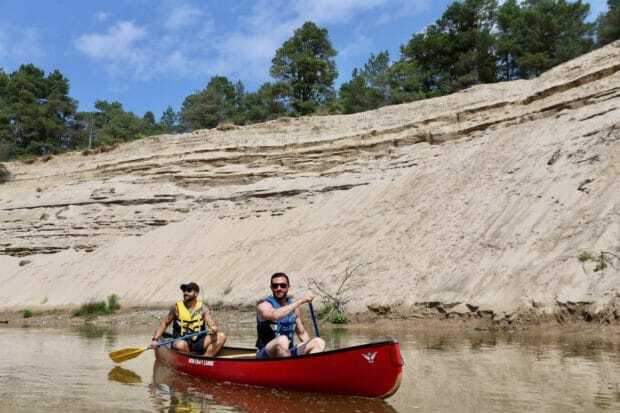 If you’re exploring the region for the first time here’s a list of top attractions to make your camping adventure in Wasaga Beach a memorable one. Wasaga Beach Camping Attractions: the region’s best mini golf course. 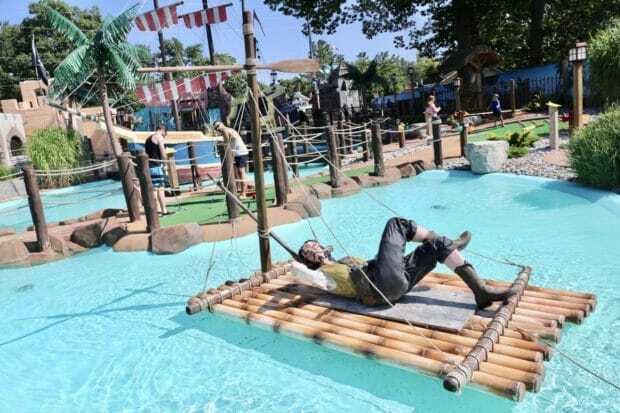 Located in the heart of Wasaga, Skull Island offers 18 holes of pirate-loving fun for mini golf fans young and old. The creative course features a gushing waterfall, meandering river, and impressive pirate ship. Best to plan your visit in the morning to avoid long lines of Tiger Woods wannabees. Wasaga Beach Camping Attractions: street food and local craft beer. 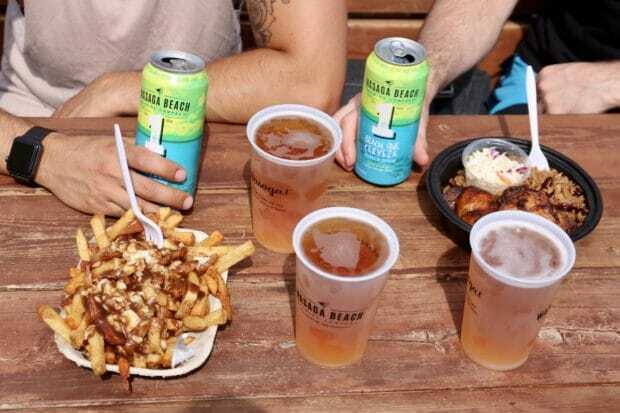 After spending hours relaxing on the beach skip up to the Main Street Market and you’ll find a choir of colourful food trucks serving up street food faves such as Jamaican jerk, poutine, and tacos. Grab a seat at the nearby Wasaga Beach Brewing Company’s Beach Bar and slurp through a few pints of cold craft beer while enjoying sweet songs played by a live band. Wasaga Beach Camping Attractions: Ontario’s best Go Kart track. If you’ve got a need for speed Wasaga 500 Go-Karts offers a thrilling 1.6km track. 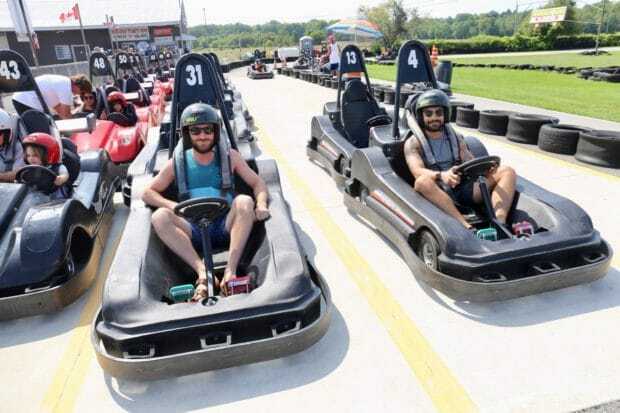 Family owned and operated since 1960, Wasaga 500 Go-Karts has expanded over the years to include batting cages, mini-putt course and snack bar. Wasaga Beach Camping Attractions: get your BBQ fix at Maple Diner. If you’ve got a craving for a finger-licking-good BBQ feast head to Maple Diner and Smokehouse. It’s a fave for local meat lovers as the kitchen smokes its own chicken, pulled pork and brisket. 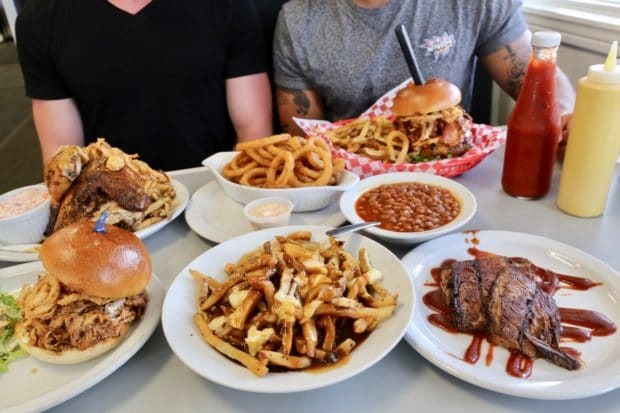 You’ll also find classic Canadiana diner faves such as poutine, pork and beans, onion rings, and a long list of Angus beef burgers. Wasaga Beach Camping Attractions: the perfect plan for a rainy day. In operation since 1992, Wasaga Beach Adventure Park has been consistently ranked as one of the top spots to play paintball in Canada. The massive park contains 13 unique fields featuring wooded and landscaped terrain designed specifically for paintball. Paintball aficionado’s from near and far visit on weekends to master the days mock battle but there are plenty of other activities for those who have a fear of getting punched with little balls of paint. 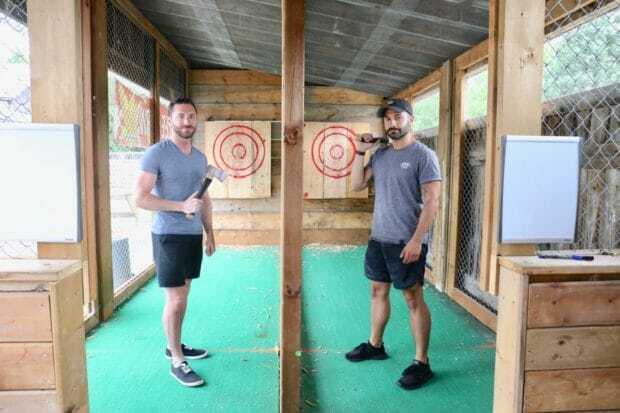 The space also includes indoor laser tag, nerf wars, axe throwing and escape rooms…all of which offer a perfectly fun solution to a rainy day. 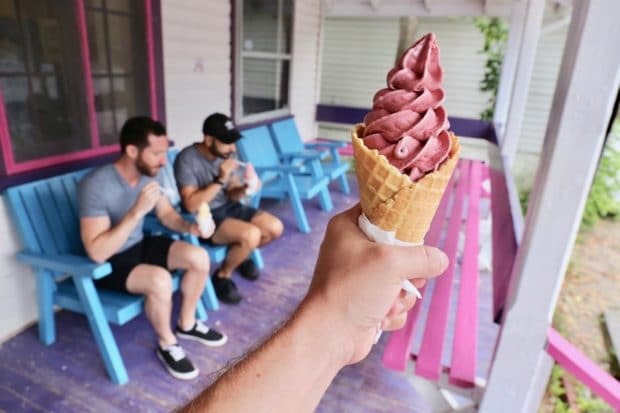 Wasaga Beach Camping Attractions: the region’s best frozen yogurt shop. Mr Norm’s Nephew has been a local staple in the region for sweet snackers since it first opened in the 1980s. The iconic ice cream and frozen yogurt parlour offers a slew of flavour options which you can mix and muddle to produce your very own personalized dessert. Wasaga Beach Camping Attractions: enjoy a canoe paddle on the Nottawasaga River. If you’re keen to get outside and enjoy a slice of the regions natural wonders book a private paddle with Free Spirit Tours. You’ll spend two hours paddling with a friendly guide down Ontario’s famous Nottawasaga River via kayak or canoe. The blissful boat adventure takes you down a quiet stream where thousand year old sand dunes, lush forrest, and contemporary cottages meet. Wasaga Beach Camping Attractions: tired of campfire feasts? Enjoy an elegant steak and seafood dinner. 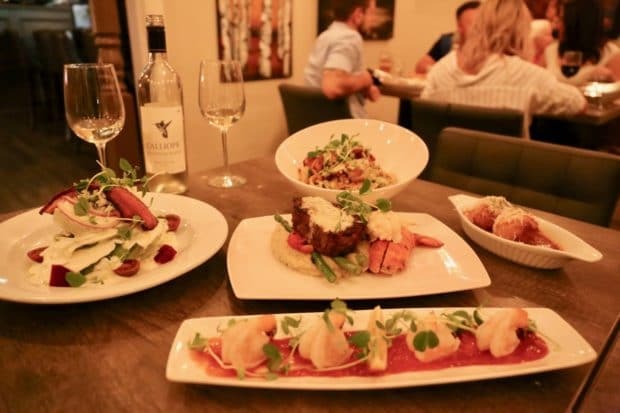 Wasaga’s premiere fine dining restaurant is Catch 22 Grill. The tiny cottage features an intimate dining room adorned with paintings by local artists and a petite bar where Canadian wines, craft beer and sweet cocktails are mixed and muddled. Chef Bob Bickmore’s menu celebrates a love of surf and turf with highlights including crispy arancini, thick smoked bacon topped wedge salad, and fancy fillet mignon paired with steamed lobster tail. Wasaga Beach Camping Attractions: drive to Midland to enjoy a film under the stars. There’s no better way to wind down after a long day then by enjoying a vintage al fresco theatrical experience. 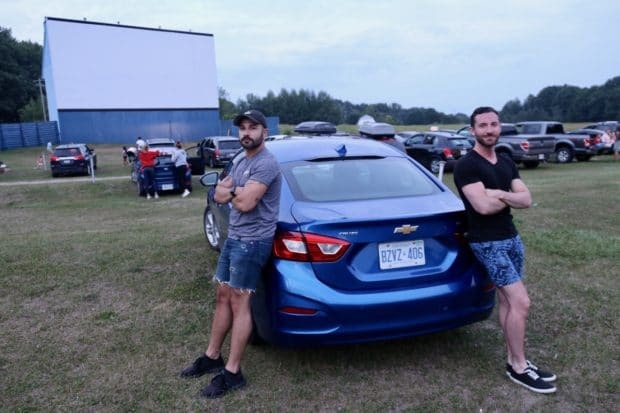 Located a short 20 minute drive from Wasaga, Midland Drive-In is the regions most popular movie theatre during the warm summer months. The Drive-In offers double features on weekends and an old school snack station featuring buttered popcorn, plump hot dogs, and nachos covered in liquid cheese.